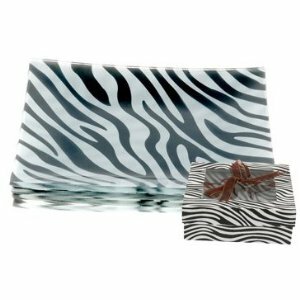 Designed with a unique square shape and exotic animal print, the Black and White Zebra Pattern Square Glass Plate will make your dinner gathering party complete. Finely crafted, this black and white plate looks fantastic with any table decor.The glamour of old Hollywood is the embodiment of the predominantly black and silver accessories in the Silver Noire Group. This color palette makes a dramatic statement for Holiday decorating but also has the staying power throughout the rest of the year. Sophistication and elegance are the cornerstones of this collection. Gift boxed. Glass. Each plate measures 6″ x 6″. Available in Leopard Print too. For more details, click “Buy Now.